From check-ins to treasure hunts, today's promotional campaigns rely on kids' influence to go viral. In 1975, there was one song every kid knew by heart: “Two-all-beef-patties-special-sauce-lettuce-cheese-pickles-onions-on-a-sesame-seed-bun.” By any measure, it was a viral success. Companies still use tweens and teens to do their marketing for them. And today’s youth marketing methods still focus on activities kids love, such as sending funny GIFs, watching YouTube, and applying cool Snapchat filters. But yesterday’s Big Mac song is today’s big data grab: The information trail your kids leave behind online equals big bucks for companies. You’ll only find out what you’re giving up by reading the small print in privacy policies. So it falls to parents to help kids build their marketing savvy, think critically about their digital footprint, and be clear-eyed about using so-called free stuff. You could argue that kids enjoy these gimmicks — so a little payback to the marketers is a small price to pay. But the lack of transparency about how companies track digital data, combined with the risks kids take when they go public, make this an uneven playing field. And remember: kids are kids. They’re susceptible to marketing messages, sensitive to peer approval, and impulsive. But they also don’t like to be tricked. Parents can help kids understand how these ploys work. Learn more about the impact of marketing on kids, how to help your kids view all media critically, and think through marketing messages. Take a look at some of the genius ways companies are getting kids to do their marketing for them. If you were a retailer, wouldn’t you want to create a store kids never had to leave and virtually follow them around to find out what they liked so you could sell them more? That’s the idea behind the Justice Store’s Live Justice app, which lets kids create profiles, connect with friends, and upload photos and videos of themselves (sort of like a kiddie Facebook, but only for customers). It offers wishlists, exclusive content, and deals, as well as delivers advertising directly to your kid (and tracks everything she does in the app). 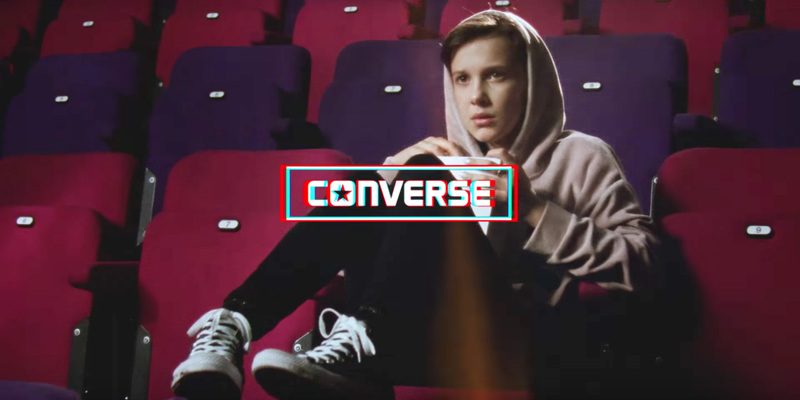 Iconic sneaker brand Converse taps into the “reaction GIF” trend with its back-to-school First Day Feels campaign, a series of 32 shareable images starring Stranger Things actor Millie Bobby Brown. Kids can use the images to express themselves in photos instead of words. Companies can track the path of these GIFs and may follow their digital trail — which could be used to create demographic profiles for marketing purposes or to potentially share or sell that information to other brands. Pioneered by Snapchat, geofilters are images that businesses create and make accessible to a specific location. Say you’re a lemonade stand at Coachella. Make a really cool filter only people near your booth can get. Concert-goers will love sending out the image either to fellow attendees, so they can find you (just look for the booth that matches the Snap) or to the poor souls who couldn’t make the show and enjoy the delicious, refreshing drink. The images serve as advertising, deployed by users. Both Snapchat and the third parties have access to the user data. What’s cooler than the next Star Wars movie? Augmented reality. What’s cooler than commercials? Disney’s Star Wars Treasure Hunt — a giant game that fans want to play so bad they may not notice that they’re totally promoting your product. Taking place in 20,000 stores across the United States in fall 2017, Disney’s Last Jedi treasure hunt uses an AR app (sort of like Pokémon Go) to lead players to stores to find Last Jedi characters. The app lets you take photos and videos and upload everything to your social media account — infinitely magnifying the reach of the event. In the internet economy, the people who watch other people on YouTube have as much value to companies as the YouTube hosts themselves. The folks who do product reviews on YouTube — called social media influencers — for things like makeup, clothes, and hair products typically get free products from companies so that they can discuss (i.e., promote) them. But it’s the audience for these videos that companies really want to reach. These (mostly) teen girls are highly prized trendsetters and word-of-mouth influencers who will tell all the kids at school about the latest thing she saw on YouTube. The Federal Trade Commission is cracking down on social media influencers to make sure they’re disclosing their sponsorships. That won’t change word-of-mouth marketing, but it will at least clarify that social media influencers are compensated. Some kids live for Instagram glory. Some companies live for free advertising. That’s the arrangement behind Levi’s #LiveInLevis campaign. Take a cool pic of yourself wearing Levi’s, add the hashtag, and wait for the company to leave a comment asking to feature your photo on their site. Voilà — instant brand ambassador! It’s called “user-generated content,” and marketers love it because it conveys authenticity when real people use your product. Most user-generated content becomes the property of the brand after they post your image.